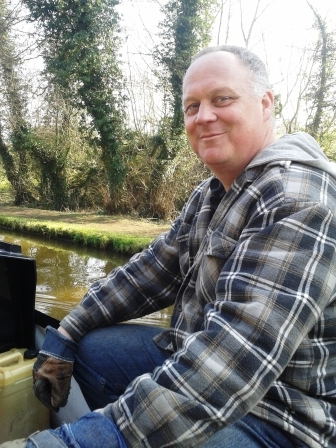 Keith and Nicky downsized their property in Jersey, used the released capital to buy their 57′ “go anywhere” narrowboat and now live on their boat full time while they continuously cruise the canal network. 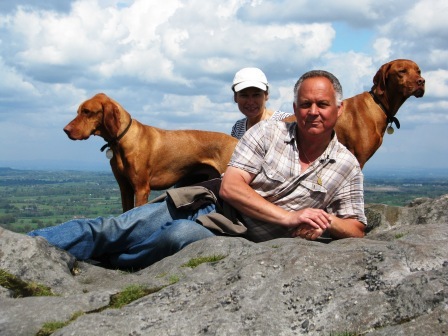 We’re Keith and Nicky from Jersey and live on our narrowboat with our two Hungarian Vizsla’s called Binks and Benji. Over the years we’d talked about retiring before fifty, but it was more a ‘what if’ sort of dream. Changes at work though, that also happened to coincide with our sons leaving home, caused us to bring our dream out of the cupboard and dust it off. We’ve also enjoyed a number of boating holidays over the years (only one on a narrowboat though) and the two elements merged. So at 48 and 46 we retired, moved aboard and haven’t regretted it for a second. 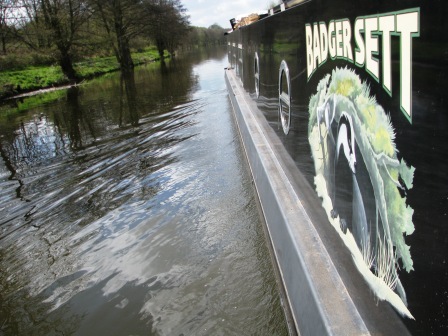 The narrowboat we brought was called Badger Sett and liked it along with its picture so kept it the same. No, we plan to continuously cruise the network and so are of ‘no fixed abode’. It is a 57’ cruiser stern. 57’ because we want to get around as much of the network as possible. That said though, I believe it is possible for slightly longer boats to make it although this may require taking off front and rear fenders, going into locks diagonally and getting a bit wet if you’re hard up against the cill in the lock and all seems to be a bit of hassle. A cruiser stern so we’ve got somewhere ‘comfortable’ to sit outside with proper chairs in the summer (!) 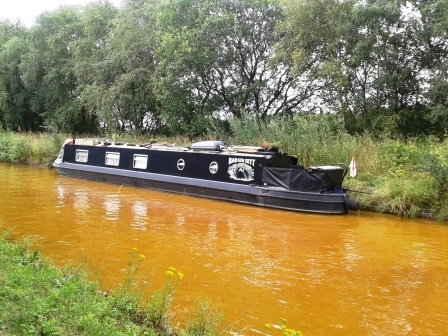 whilst having the ease and privacy of being off the tow path. Our choice won’t necessarily suit everyone, but it suits us and that’s what matters. Eighteen months, ten of which we’ve been living aboard and six months as actual continuous cruisers. Downsized our property and used some of the money. Last year it was just holiday’s so about six weeks or so, now we are aboard full time. Nothing yet, but I’m sure if we try really really hard, we might manage to come up with something ! The flexibility and benefits of being continuous cruisers. Nothing, it really does suit us perfectly. We look out for / plan around main supermarkets and get the shop back to the boat using rucksacks. Can be a bit of a trudge sometimes, 45 minutes each way has been the worst yet so far, but we still lived to tell the tale. We’ve done a couple of shops using Tesco and Sainsbury Online when main supermarkets have not been convenient to our location or travel plans and found them to be very useful in these cases. We were thinking of getting a washing machine, but decided to see how we got on using launderettes and so far we’re getting on okay. It’s one of those trade off’s and considering the power usage, water usage and the space it would take up we were planning to stay as we are. We recently spoke to someone who had a small twin tub though and they were very pleased with it so we’re thinking of this as an option. We’d initially decided that a pump out would be our preference, but changed our minds whilst looking at boats and now have a cassette toilet. We also brought two spare cassettes so our cruising wouldn’t be dictated by having to get to an Elsan point. The other huge benefit we’ve found is that not having a waste tank under the bed provides for a lot of extra storage space. Initially with a Three dongle and balancing the laptop on a pile of books by the window or hanging the dongle out the window when the signal wasn’t good. Ended up getting a Three Mi-Fi and found that it works very well, even inside the boat. If the signal is a bit poor then it goes out in the cratch. The other benefit is that you can then use the laptop, plus other WiFi devices, where you want in the boat without consideration to the signal. Early days for us, but The Langollen has to take pride of place so far. We had some solar panels fitted in December ( 3 x 195w ) and since the beginning of February we haven’t run the engine other than for travelling. We very rarely travel every day, normally every other day and in February we only clocked up 26 hours on the engine. 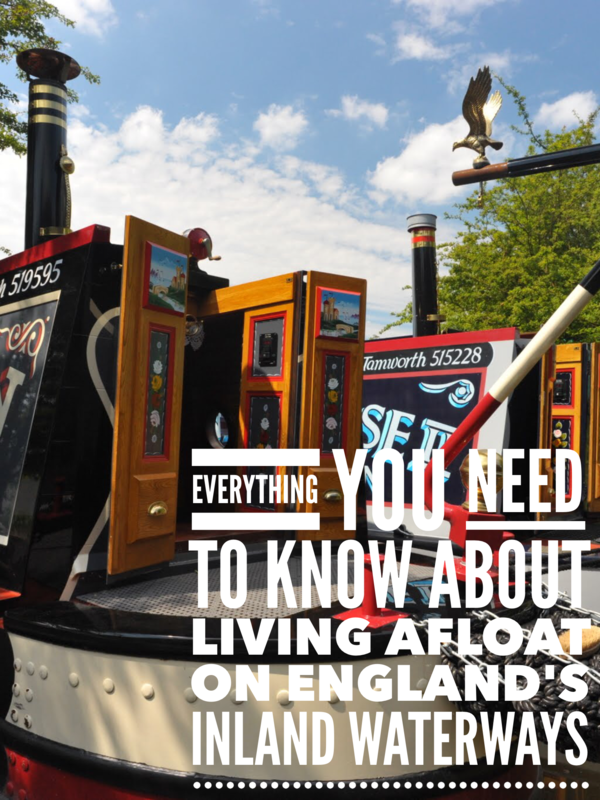 We’ve recently stayed put in the same place for four weeks (June) and only ran the engine for one hour during that time to move the boat to comply with mooring/cruising regulations. We are considerate about the power we use though and have fitted LED lights throughout, had some 12v plug sockets and car charger sockets installed and use these for power whenever possible. Even came across a car charger with just a USB socket in the end of it and brought ourselves a USB cable and selection of adaptors. We leave the inverter switched off and when we do have to turn it on, we try and do so when we’re travelling. The darker months of November, December and January will be the telling time for us though and we’ll no doubt have to scale back our power usage or give consideration to running the engine, but we’ll cross that bridge (or travel that canal) when we get there. Warmest house we’ve ever lived in. Be ready to make compromises as you’ll need to adapt your lifestyle to the boat and not the other way round. Can you use the 3 MiiFi to download books onto an e-reader? In a word, yes. Here’s a review.